Sick of bulky knits? These tops won't ~sweat~ it. 1. A velvet cold shoulder top, because this'll make it more than possible to grin and bare getting dressed for a night out *without* sacrificing style for warmth. Get it from Amazon for $18.99 (available in sizes S-XL and four colors). 2. 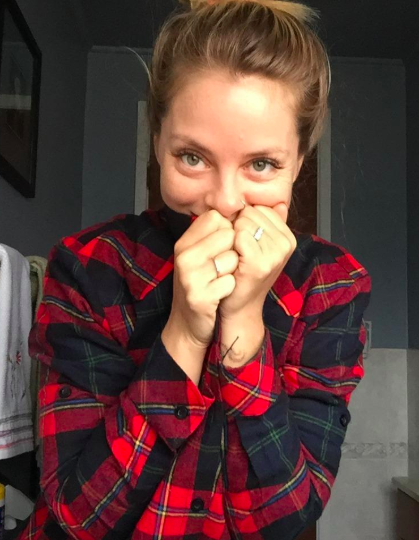 A plaid button-down flannel for reconnecting with your favorite band T-shirt when layering the two together. Those sweaters were really keeping you two apart. Get it from Amazon for $12.99+ (available in sizes XS-XXL and 28 colors). 3. A ruffled knit top so it's actually possible to look fashionable despite the ominous weather forecast. Get it from Forever 21 for $32 (available in sizes 1X-3X and two colors). 4. 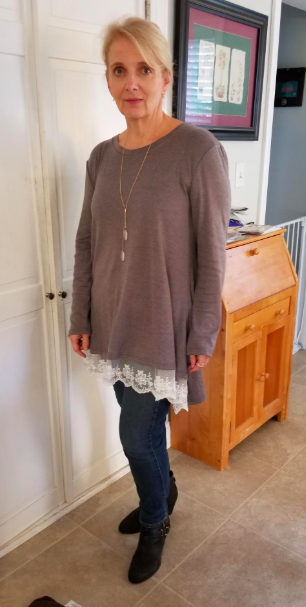 A lacy A-line tunic that'll give you the best of both worlds: you'll still get to wear your leggings every day and you'll look extra stylish. ALL while staying nice and cozy. Amazing. Get it from Amazon for $18.99+ (available in sizes S-XXL and 17 colors). 5. An off-the-shoulder sweatshirt, because it's time to shrug off the burden of wearing the same exact sweaters every darn week. Your jeans are begging you to switch it up. Get it from H&M for $12.99 (available in sizes XXS–XL. 6. 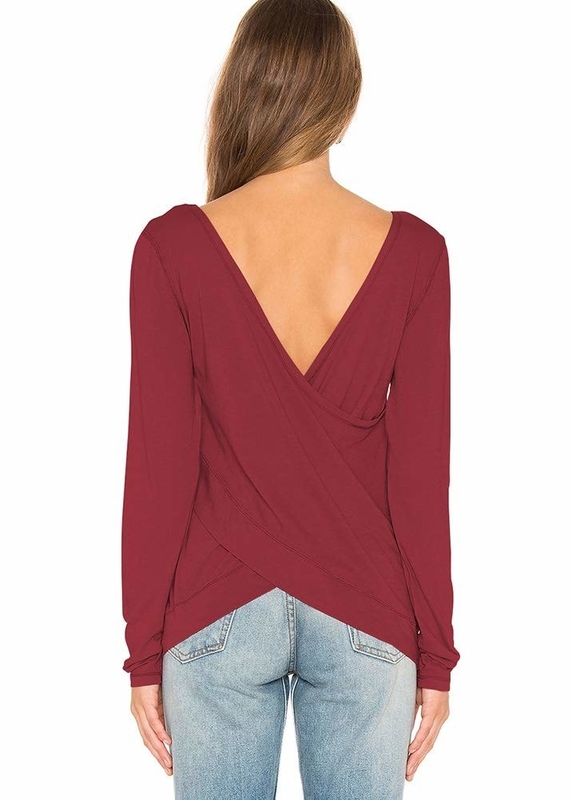 An open back long-sleeve top for scaring off winter blues with a major statement. Get it from Amazon for $12.99+ (available in sizes S-XL and five colors and styles). 7. A sweatshirt tunic with a tulle hem so you can call your wardrobe "cozy and lazy, but make it fashion." It's never been so rewarding to throw on leggings. Get it from Lane Bryant for $38.99 (originally $49.95; available in sizes 14/16-26/28). 8. A button-down top with a chic knot that'll keep you comfy, and add a *touch* of polish. Say goodbye to bulky knits that only make you overheat in the office. Get it from Amazon for $5.99+ (available in sizes S-XL and in five colors). 9. A striped lightweight turtleneck, because you'll look effortlessly cool instead of sweating it out on the subway in thick yarn. Get it from American Eagle for $22.46 (originally $29.95; available in sizes XXS-XXL). 10. 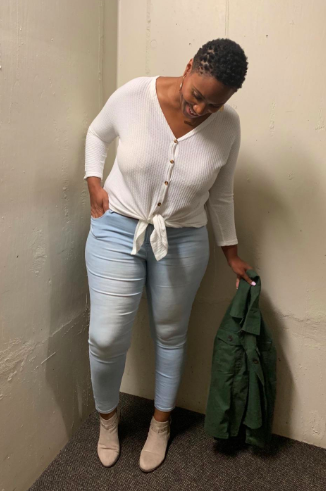 A denim button-down shirt you can wear alone or layered when you need a break from your usual rotation between the same three sweaters. Believe me, your closet is starting to sing the blues. Get it from Amazon for $29.53+ (available in sizes XS-3XL and four colors). 11. A shimmering bodysuit so a night out doesn't mean freezing your tuchus off — have your cardigans ever done this for you? I DON'T THINK SO. 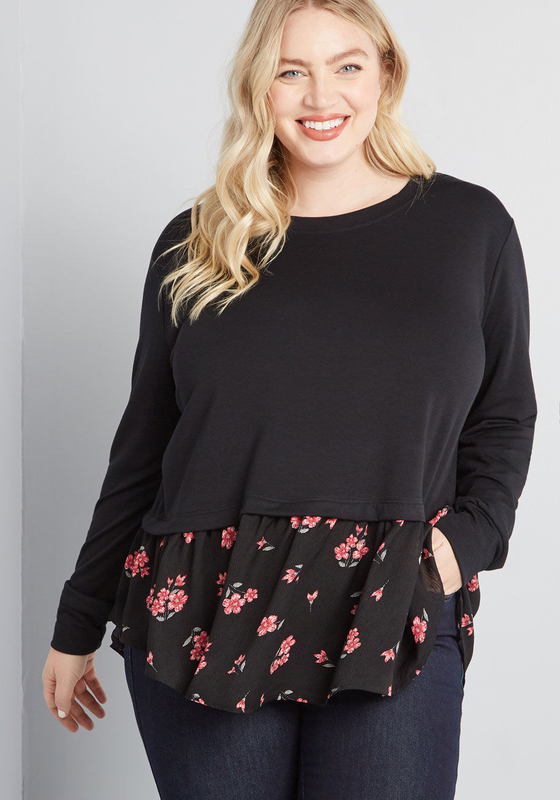 Get them from Nordstrom: the first top for $35.40 (originally $59; available in sizes 1X-4X and two colors) and the second top for $34.80 (originally $58; available in sizes XS-XXL and two colors). 12. A colorblock long-sleeve top that'll immediately give your favorite jeans new life. I overheard them saying that they're feeling a little suffocated by your knits. Get it from Amazon for $15.99+ (available in sizes S-XL and seven colors). 13. 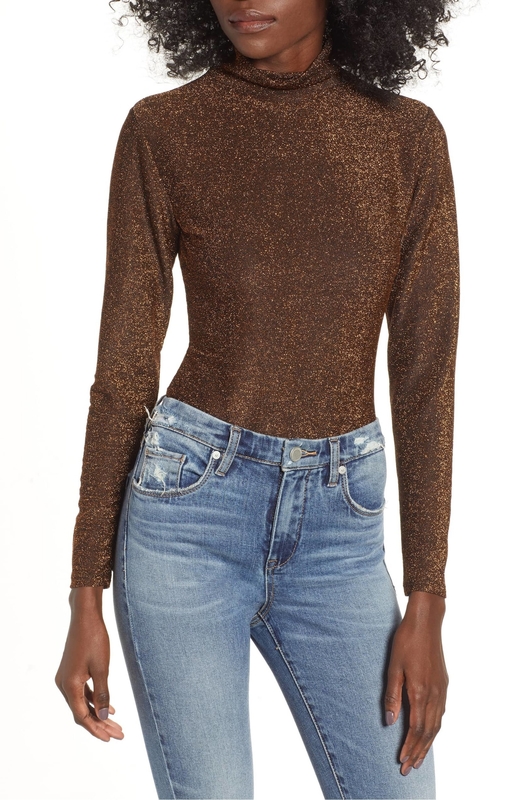 A corduroy blouse with puff sleeves, because this'll make it so easy to look professional AND feel warm you'll almost want to go to work. Get it from Nasty Gal for $30 (originally $60; available in sizes 2-8). 14. 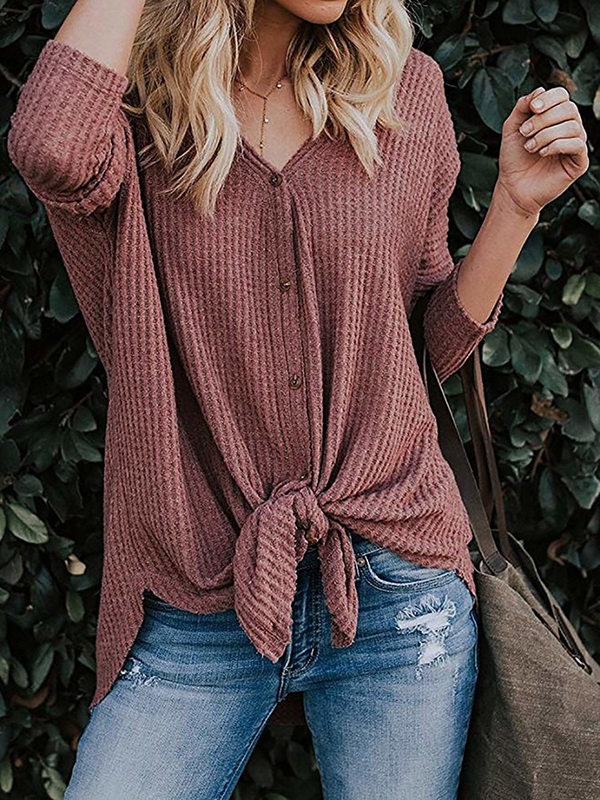 An asymmetrical cold-shoulder top for giving your winter wardrobe a much-needed ~twist~, thanks to this top's trendy bottom. Get it from Amazon for $9.99+ (available in sizes S-XXL and nine colors). 15. A ruffled turtleneck tunic so you can ditch boring knits for a pretty one-and-done outfit. It turns out your leggings prefer to feel dressed up. Get it from Free People for $78 (available in sizes XS-XL and two colors). 16. A belted blouse that'll surprise the heck out of your office when you show up looking like a polished adult. Dare I say they might even get *shivers*. Get it from Amazon for $9.99+ (available in sizes 16-24 and three colors). 17. A relaxed animal print T-shirt with elbow cutouts, because your routine has started to feel a little too tame. This'll shake things up without leaving you in the cold. Get it from AllSaints for $36 (originally $90; available in sizes XS-L). 18. 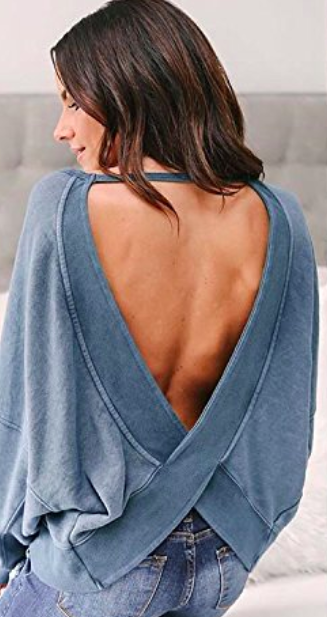 A backless sweatshirt for tricking everyone into thinking you tried more than usual, but are actually spending all day cozily wrapped in sweats. Get it from Amazon for $4.59+ (available in sizes S-XL and in four colors). 19. A plaid button-down top so you can rely on this for years to come whenever you need an escape from your usual go-to's (but still need lots of warmth). Meaning: this'll never go out of style. Get it from Torrid for $48.90 (available in sizes M-6X). 20. A cropped workout top with trendy thumbholes that'll keep you toasty on the way to the gym while still looking the part. I'm no athlete, but I don't *think* people wear sweaters to go boxing. Get it from Amazon for $14.99+ (available in sizes S-XL and three colors). 21. A starry oversized cotton blouse, because looking ~cool~ has never felt so cuddly. 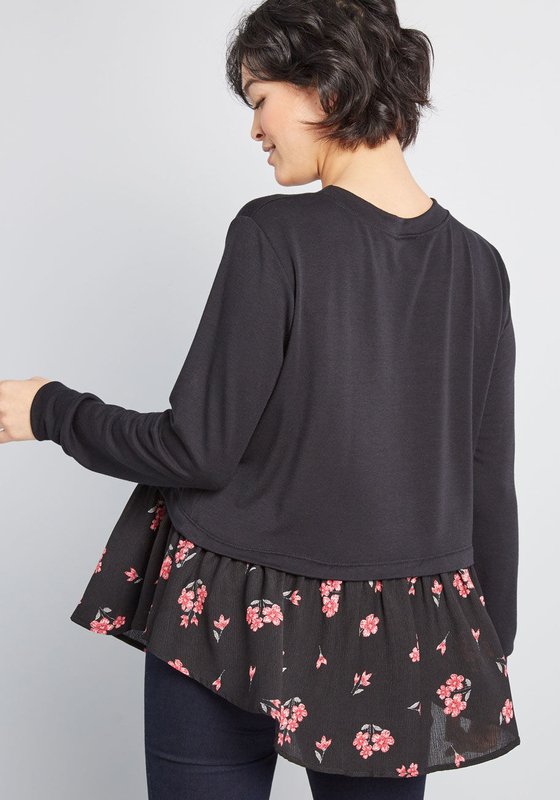 Warning: you may spend your whole work day snuggling with this top. Did I mention its double-faced print? It has a striped interior! Get it from Madewell for $79.50 (available in sizes XXS-2X). 22. 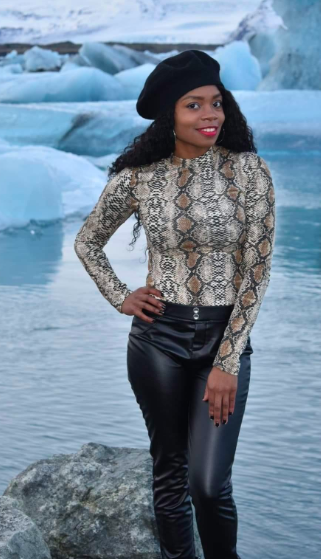 A super soft snakeskin bodysuit for spending a night out feeling like you've just been tucked in. Please don't blame me if this makes you want to go home even earlier. Get it from Amazon for $14.99 (available in sizes S-L). 23. A striped crew-neck top so you can both update old button-downs (hello, chic layering) or wear it alone on chilly mornings. Either way, you can say goodbye to freezing. Get it from Target for $18 (available in sizes 1X-4X). 24. A velvet T-shirt that'll help you make a *smooth* transition from overusing the same three tops. Ironically, you may find yourself wearing THIS way too often. Promising review: "I love, love, love this velvet top!! It's a very well-made top, they did not skimp anywhere. The velvet is fairly heavy, not thin and cheap. The sleeves are long; they did not cut corners with them. It feels super luxurious against the skin — I intend to order more colors!" —Melinda B. Get it from Amazon for $14.86+ (available in sizes S-XL and eight colors). 25. A ruffled statement blouse, because winter weather doesn't stand a CHANCE at ruining this red hot number. You may even sizzle a little. 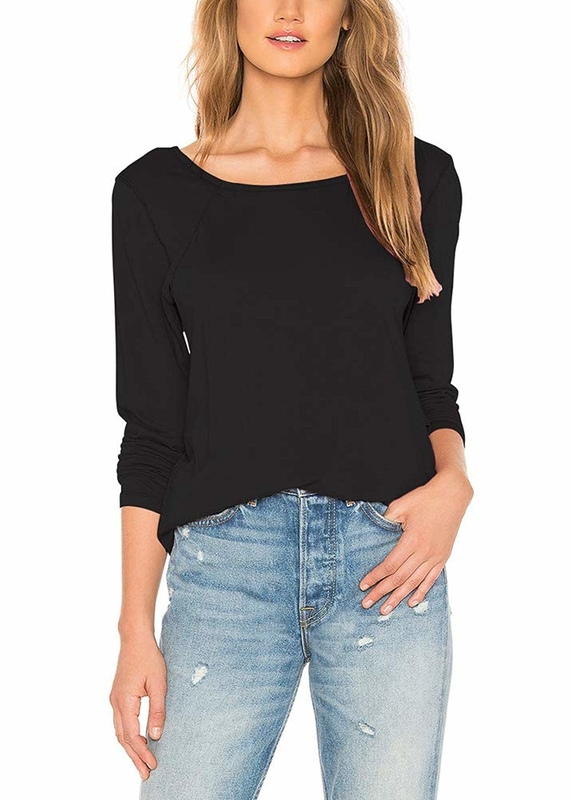 Get it from Shopbop for $62.40 (originally $208; available in sizes XS-L). 26. 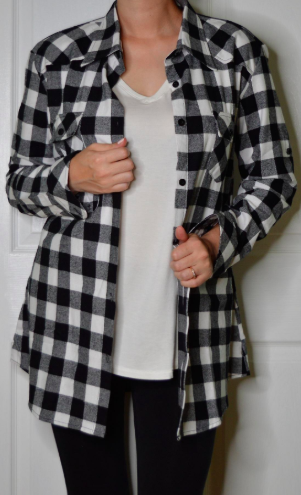 A long flannel button-down with pockets (!!!!) for a new approach to staying fashionably warm. Think of this as a super trendy robe when you rudely have to leave your home. Get it from Amazon for $15.99+ (available in sizes S-XXL and in three colors). 27. A soft knit layered pullover so your motivation to leave the house doesn't wither the minute you step outside. These florals can actually survive winter weather. Get it from ModCloth for $49 (available in sizes XS-4X). 28. A ruffled peplum top that'll save all the drama for your outfit — no more going back and forth between sweating and freezing on your way to work. Get it from Amazon for $17.99+ (available in sizes XS-XXL and seven colors, in short and long sleeves). 29. An asymmetrical soft knit top, because this'll help you win a tie between keeping warm and looking on-trend. You WILL want to tie the knot with this. Get it from Tobi for $18+ (originally $84; available in sizes XS-XL and two colors). 30. 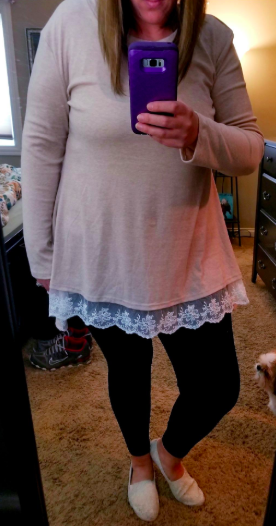 A cotton and lace tunic top to beat sweaters at their own game — you'll feel just as cozied up, minus the lovely back sweat. Get it from Amazon for $19.99+ (available in sizes 1X-5X and two colors). 31. An oversized layered long-sleeve top for transitioning from pajamas to a comfy outfit in no time at all. Will this accidentally inspire you to nap at your desk? Perhaps. Get it from Urban Outfitters for $44 (available in sizes XS-XL and two colors).